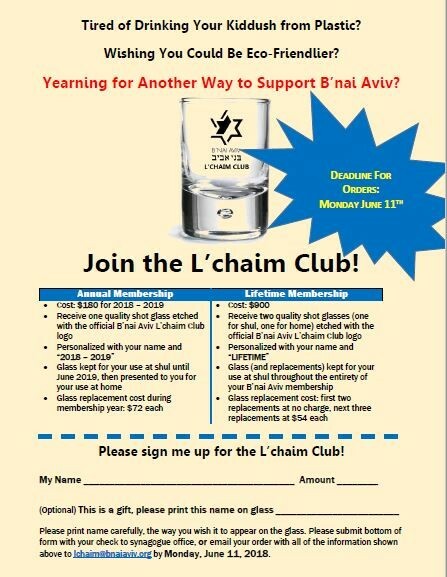 Membership has now officially opened for the upcoming FIFTH big year of the L’chaim Club! The L’chaim Club is a fun, innovative way to financially support B’nai Aviv while enhancing the spirit of congregational warmth and friendship during our Kiddush. Members of the L’chaim Club receive a beautiful customized shot glass, personalized with their names, to use during the Kiddush and other shul events. or, simply email your order information to lchaim@bnaiaviv.org (no apostrophe in L’chaim). If you want to receive your glass in the very first shipment arriving in July (so that you don’t have to drink from plastic), you need to get your order in by Monday, June 11th. If you have any questions, please email Autumn at autumn@bnaiaviv.org.